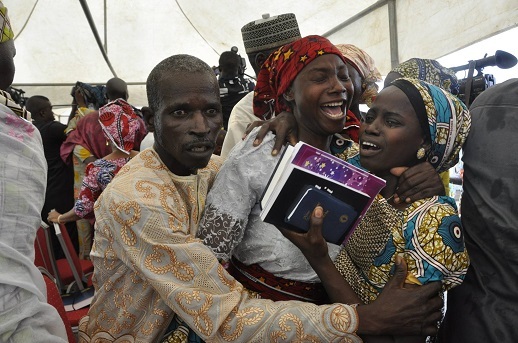 Joy and tears as parents reunite with the 21 released Chibok schoolgirls, Abuja, Nigeria, Oct. 2016. 13 Oct. 2016: 21 girls were released by Boko Haram following negotiations with the government. 5 Nov. 2016: Another girl was discovered in Pulka in northern Borno State. Maryam Ali Maiyanga was found by soldiers screening escapees from Boko Haram’s base in the Sambisa forest. She was carrying a 10-month-old baby boy. According to BBOG, Maryam was Number 198 on its register of kidnapped girls; she comes from Askira Uba, and was abducted along with her twin – who is yet to return. According to the government, a splinter group of Boko Haram has been willing to negotiate the release of 83 more girls. 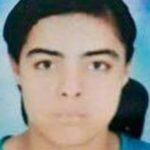 CNN has reported that the other 114 girls are dead, or, reportedly, don’t want to leave their kidnappers because they are now married or have been radicalised. The 21 met President Muhammadu Buhari days after their release, on 19 October. They thanked him personally for his part in their release. Since then, they’ve been undergoing intense psychological evaluations at a medical facility in the capital, Abuja. There has been some criticism that the freed girls are being too closely “protected” by the government, keeping them away from their home community and depriving them of the vital therapeutic benefits of close family companionship in the months since their re-appearance from the horrific conditions of the Boko Haram camps. However, Yakubu Nkeki, Chairman of the Chibok Abducted Girls’ Parents group told World Watch Monitor the 21 released girls were taken to Chibok to celebrate Christmas and the New Year with their parents, staying almost four days. Initially, the parents, who came from various villages around Chibok, expected to take their girls home, but the military advised that they should be kept in Chibok town – in one place – for security reasons, said Nkeki. Nevertheless, the girls stayed with their parents in Chibok, and others could meet them freely. Nkeki described the atmosphere when the parents met the girls as “full of emotions”, with parents and girls hugging each other, and much singing and clapping. “On Christmas Day, as security advised us not to move the girls to the EYN congregation, we invited the parents and one pastor, the CAN Chairman of Chibok, to come and pray with them instead. It was a special Christmas service. We bought two rams and more than 30 chickens to make a delicious meal for the girls and their parents,” he said. On 26 Dec, the Governor of Borno State went to Chibok to see the girls, and apparently endorsed the plan for the parents to stay with their daughters in the Borno State capital, Maiduguri, until 8 January when the girls are due to return to Abuja. Nkeki also countered the fears expressed by some campaigners that the girls have abandoned their Christian belief and background. “Seriously, the girls are free to pray and worship. You can hear them singing. They are free to worship at any time. Since most are Christians, every day – with their parents – they have morning and evening devotional times,” he said. In Nigeria, the campaign group plans to march daily from Sun 8 to Sat 14 Jan, to the entrance of Aso Villa (the presidential palace), to urge President Mahammadu Buhari to rescue the 195 girls so far unaccounted for. In the US: on 7 January, there will be a discussion of “The Chibok Girls: The Boko Haram Kidnappings and Islamist Militancy in Nigeria”, led by Nigerian-born scholar and author Helon Habila, Associate Professor at US’s George Mason University. His book, based on interviews with three survivors and their families, along with security personnel, NGO workers, and other residents of Chibok, gives insight into the conditions that led to Boko Haram’s rise and that continue to fuel northern Nigeria’s long religious and ethnic clashes. On 8 Jan, there will be a Gathering at the White House Side Park, in Washington DC, in solidarity with the people of Nigeria.